My son just had a camping themed birthday party and I wanted to make a special cake for him. 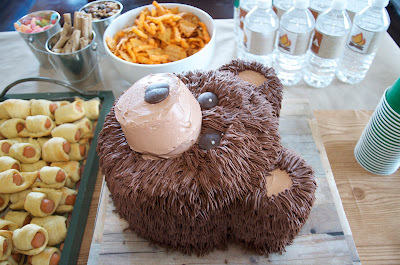 After searching the internet and Pinterest we decided that a bear cake would be perfect! Even though this cake looks difficult, it's one of the easiest I've ever done! You can totally do it too! I came across an adorable polar bear cake here. I loved it and decided it would be the cake to use as inspiration for my son's. I made a three 8 inch round cakes, leveled them with a knife, and put buttercream frosting in between the layers. I also made 6 large cupcakes (one for the bear...the rest for us to eat). I frosted the bear with chocolate buttercream first. Then I frosted one of the large cupcakes in brown tinted regular buttercream and placed it upside down on the cakes. This became the snout. I used 8 store bought rice crispy treats for each ear. I just smashed them together until they started looking like an ear. I ended up using a knife to finish shaping them. I frosted them with the chocolate buttercream too. And then I stuck them next the the head so they looked like ears. The eyebrows were made out of one small chocolate donut that I cut in half and then in half again (length wise to get a flat bottom). I also frosted the donut with chocolate buttercream. Next I smoothed some brown tinted regular buttercream on the ears for the middle sections. 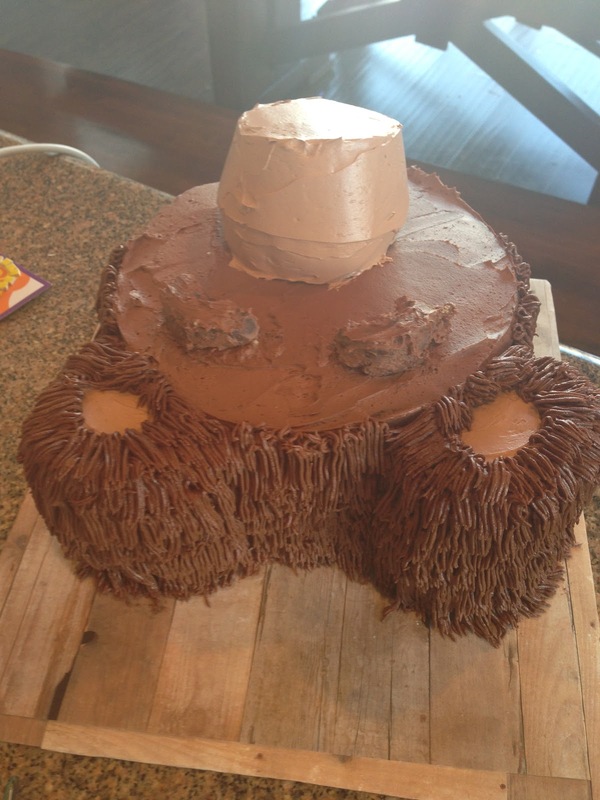 Then I used Wilton tip 233 to cover the bear in fur. I started on the back of his head at the bottom. I covered his head in rows working across the bottom then moving up. I continued adding fur until the entire bear was covered. You want to start low and work high so the fur lays on top of each section. That's what makes it look real. I took breaks while making the fur...my hand was killing me. You might want to make your frosting on the slightly thinner side to avoid a cramped hand! Or plan to do it in sections. I tried to think about the direction his fur would go and made sure to pipe in the right direction. The eyes and nose are made out of Wilton melting chocolates. I rubbed them with my fingers so the chocolate would heat up just enough to be shiny. The nose is two made from two pieces of chocolate cut and then rubbed together with my fingers. Finally, I took a couple pieces of white Wilton chocolates, melted them, and placed a small white dot on each eye. Here are a few more shots from different angles. What kind of icing did u pipe the fur with? Chocolate buttercream? I'm trying to pipe, but it's not staying like how yours looks..... Help?! Yes, I used Chocolate Buttercream. I'm thinking you probably need to play with the consistency a bit. If it's too wet and sloppy or runny, add more powdered sugar or cocoa powder and mix it again. If it's too stiff mix in a bit more milk. Also, if you are holding the piping bag for a long time, your hand may be heating up the frosting and melting it. Maybe try using a less full piping bag and refilling it often or set the bag in the fridge for a few minutes to let the frosting firm back up. I hope this helps! So sorry it's not going the way you hoped. This is the most incredible cake I've ever seen! I love how you made it look like fur! My daughter's first birthday party is in 2 weeks and the theme is bear, so I am going to give this "fur" tip a shot! You can totally do it Ashley! Let me know if you have any questions. Once you get your rhythm down it's pretty easy to do. Just tiring. I'd definitely suggest breaking it up a bit. Like do the crumb coat and build his face then take a break before you start the fur. Also, start the fur at the back of his ears or head so the first few rows won't show! :) Good luck! Any cake made by a Mama is sure to be a hit! 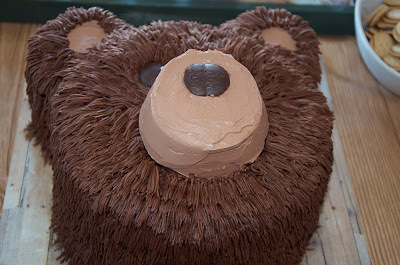 I absolutely LOVE this cake, going to attempt to make it for my fiancé who's nickname from me is 'bear', i'm just so nervous! any other tips? also, did you make your own buttercream icing? How fun! My biggest piece of advice would be to do this over a few days. Make the cakes one day, assemble the cake another day and stick it in the freezer. Then on a separate day, frost the cake. It's too much to do at once. You'll be burned out by the time you get to the fun part if you attempt too much at once. Also, get the consistency of your frosting just right. Add milk to thin it and powdered sugar to thicken it until it comes through the tip easily. I did make my own buttercream. Your cake turned out great! I'm glad the polar bear cake inspired you! Would you mind sharing your buttercream recipe? Making this for my son's 3rd birthday on Saturady. I would love to see how you make this! You wouldn't be able to do a quick YouTube video on how to do the fur could you? I would love to make this for my sons first birthday. How did you get that nice light brown for the ears and eyes? I usually do pretty well with combining food coloring but I can't figure that tint out. And I don't think my small town carries the actual Wilton brown and black coloring. Hi, I am signed into my husband's google account, but this is Heather. I used regular white buttercream (not chocolate buttercream) and just barely tinted it with brown food coloring. 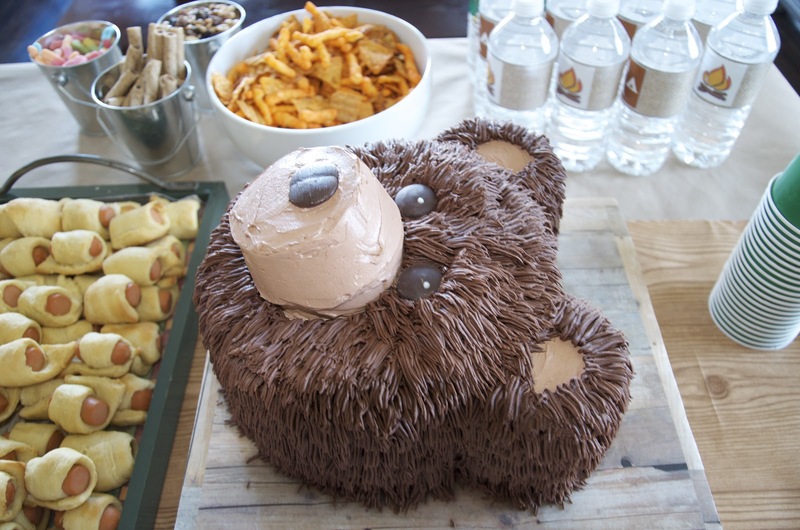 For the actual fur, I used chocolate buttercream. If you don't have access to brown, you could try adding some melted chocolate wafers into white buttercream or a vey small amount of cocoa powder. I hope that helps. Good luck with your bear cake!!! 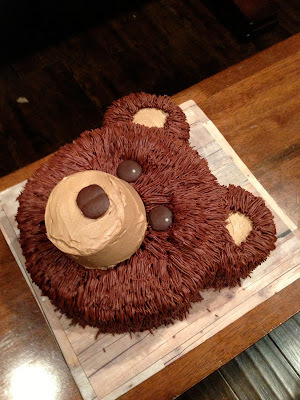 I had a wonderful experience to make a chocolate bear cake. Thanks to all because all your comments I was able to prepared this. I don't know how to send a pic of my bear cake but anyone want a tip feel free to ask. I made this cake for my sister's birthday this weekend and everyone loved it! Thank you for posting picture and instructions. I ended up using 2 boxes of cake mix and made a triple batch of the hershey's buttercream frosting. Mine was initially too runny so i just put my piping bag in the freezer for a few minutes to harden a little. I made one batch of rice krispy treats and that was perfect split down the middle for each ear. I don't know if your page is still active or not, but I thought I would give this a try. 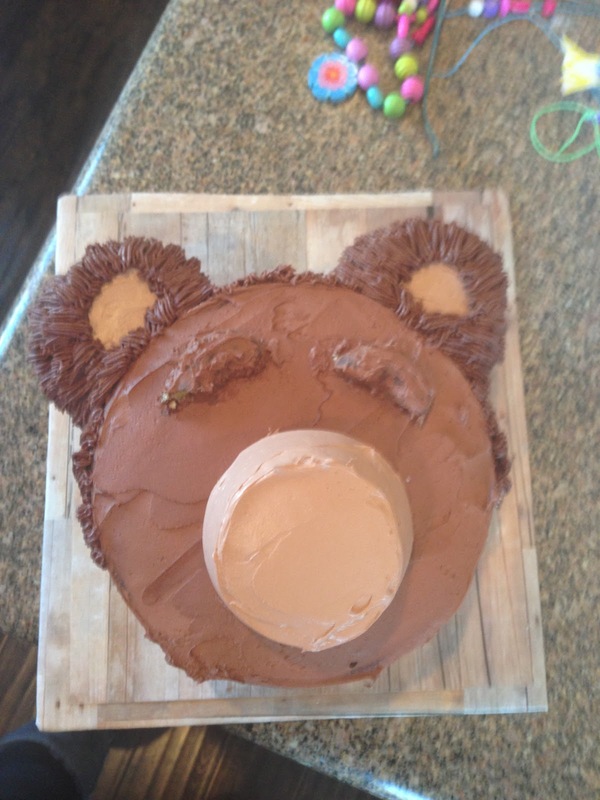 I've fallen in love with your bear cake and I would like to try to create it for my son's 1st birthday coming up in September. I was wondering if I could ask you a few questions though, because I have never attempted anything like this before. You wrote in your directions that you made 3- 8" round cakes, so does that mean I should buy 3 boxes of cake mix? One for each layer? And how much of the chocolate buttercreme should I plan to make? Would you say something like a triple batch so I have enough to cover all of the bear? Would it also be possible to share your recipe for buttercreme? If not, I absolutely understand. :) Any advice or help you can give me would be much appreciated. I also loved your suggestion of splitting this up over the course of a couple of days- great idea! :) Thank you so much in advance. I hope this conversation makes it to you. Hi Solana, I'm not sure if my response was attached as a reply or not so I wanted to let you know that I responded below. Hi! I'm happy to help! I can get two 8 inch or 9 inch cakes out of 1 box of cake mix. Plan to get two cake mix boxes. Split one into the round pans. For the other one, use 1/2 in the round pan and the other half in muffin or cupcake pans for the snout. You will have extra muffins/cupcakes left over. incorporate one entire bag of C&H powdered sugar. Add slowly. As it gets thick, add milk 1 tablespoon at a time. Once all sugar has been added, regular buttercream is complete. Use milk to thin it out anytime it looks thick. Add extra powdered sugar anytime it's too thin. To make it become chocolate buttercream you will add about 3/4 of a can of Hershey's unsweetened cocoa. You will most likely need to add more milk as it will dry out the mixture. From there, I just add more milk and sugar until I get the texture and taste I like. I really hope this helps. Have fun! I just finished making a 6" bear face for my great grandson's birthday tomorrow. He is turning 1. It is so adorable. I had to make some adjustments with nose, etc. But all turned out great. I can't wait for him to see it. Thanks for such a cute bear..one of the cutest I've ever seen. Are the 8 inch pans 2 inches deep or 3 inches deep? Baking Classes in Velachery will let you to know about the tactics over the piping which will make your cake more and more gorgeous with these piping strategy that you are about to use over your baked stuff adding up the piping over the cakes. Construction Cake With a Twist! A Little Piece of Happy....Family Chalkboard! Too Stuffy For Me....Part 5 ~ Chair Make Over! King Piggy Cake from Angry Birds!